Jersey was a stray in southwestern Virginia, and ended up in the shelter in April 2017. 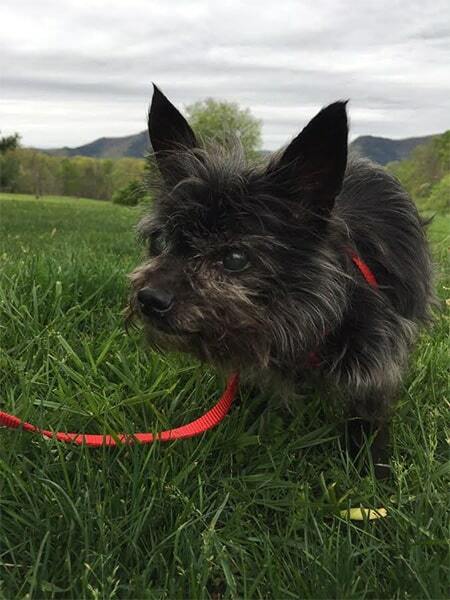 Her life was saved by the Blind Dog Rescue – not only was she saved from possible death in the shelter, but she was saved again from death by pneumonia. When she was picked up from the shelter, she was coughing. By the next day (a Sunday), she could not stop coughing, so she was rushed by her BDRA foster mom to the emergency vet clinic, where she was immediately placed on oxygen, and thus began three weeks of treatment for pneumonia. The great news is she pulled through, and now is preparing for a repair of a perineal hernia. She also needs to be spayed, and she requires a dental too, so she is on medical hold until everything is completed. But here are some things Jersey would like you to know about her in the meantime. 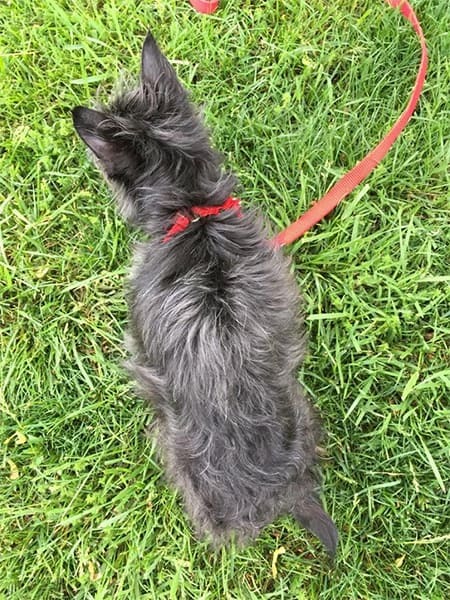 She weighs four pounds and looks like she is some kind of adorable terrier mix, although she resembles a cat when a picture is taken from overhead. She gets along with dogs and cats and people. She is crate trained and leash trained. She is not quite house trained. Although she clearly knows to go outside, she has frequent accidents inside too, which are unpredictable. She will go outside, a few times, and then come inside and go again. She has been checked for a UTI and does not have one. She is heartworm negative. She has cataracts but can see, at least a little. She also can hear. She is a bit of a busy-body, moving around the house, wanting to be in the middle of things, but also enjoys curling up for a nap. She is not yet ready to be adopted but stay tuned! Once she has completed all her medical care, an update will be posted! Jersey is forever in our hearts. Jersey is looking for her forever home. If you think it could be yours, read more about Adopting from BDRA before submitting your application below. BDRA relies on your donations to rescue blind dogs around the United States. Please consider giving in support of Jersey.